For this months challenge I was a bit container-ed out from doing the Daring Cooks savoury containers as well! However, I managed to squeeze in a few ideas. I liked the sound of the maple mousse but wasn’t brave enough to make the bacon cups. I opted for the vegan version using tofu, and another healthy & quick version of using greek yoghurt mixed with maple syrup. Both these were delicious! 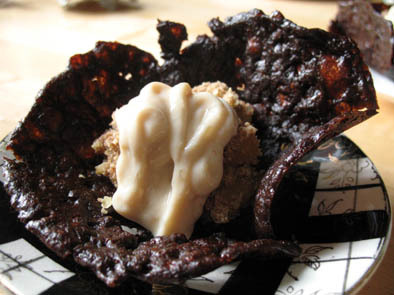 Molasses brandy snap baskets filled with tofu maple cream – I had to bake these for quite a long time before they set when drapped over an upturned ramenkin. They had a lovely crunch to them. 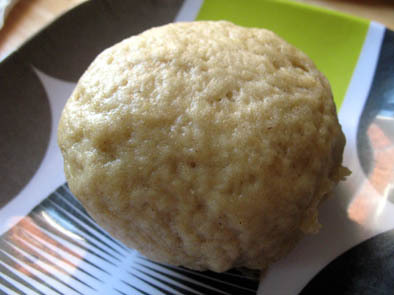 Gluten-free steamed bun – the tofu mousse solidified during the cooking process and resembled scrambled egg. Still extremely tasty. 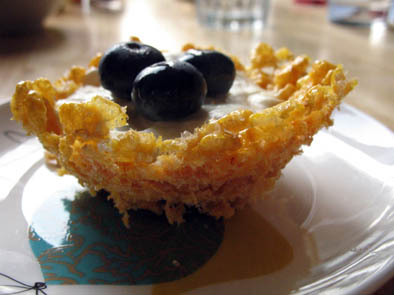 Rice-krispie and mango marshmallow basket filled with mayple syrup greek yoghurt – I had to pop this in the freezer for a bit to firm up enough so that I could remove it from the bowl without it breaking up. 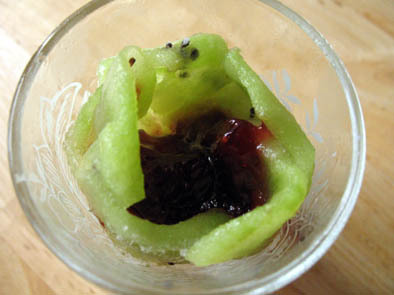 Banana & Kiwi baskets filled with strawberry conserve – unfortunately not free standing but acts kind of like a container. Looking forwards to next months challenge! • Putting aluminum foil on the muffin pan heat-proof bowls is essential or they will be stuck to the form. Be gentle when removing the aluminum foil from bacon cups. • Bacon shrinks a lot so make sure weave is tight on the form. Tuck the ends of the bacon strips inside otherwise they will curl while cooking. A good idea is to insert 4 toothpicks where the crisscrossed bacon meets in the weave. 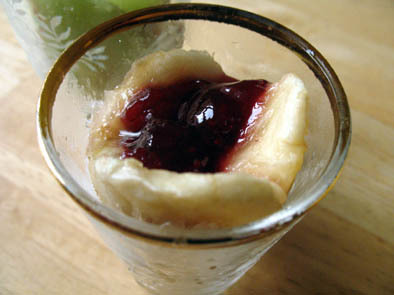 • For the nut bowls, use about 1 cup of whole nuts to get 3/4 cups of crushed. • In the maple mousse recipe, after the gelatine has bloomed (softened) in the cold whipping cream, the gelatine MUST be heated to melt completely…contrary to popular belief. Follow the directions as described and never let gelatine boil or it will become stringy and unusable. • If you make the meringues let them cool in the oven once they are baked… just don’t forget to turn off the oven when they are done. This cooling process will help then dry out nicely and be crispier. Bacon cups: preparation 15 minutes, bake 25-40 minutes depending on cup size, cooling 1 hour. Nut Crust: preparation 30 minutes, baking about 15 minutes, cooling 1 hour. Maple mousse: preparation 15 minutes, cooling 1 hour, refrigeration 1 hour. Vegan maple mousse: preparation 10 minutes, refrigeration 1hour. Meringue Time preparation 15 minutes, baking 45 minutes, cooling 2-3 hours. 1. 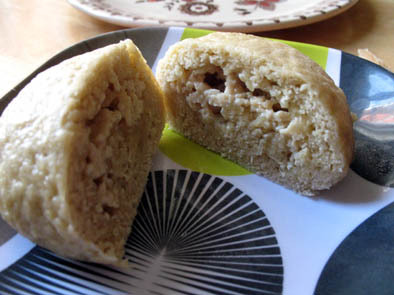 Use a food processor or a zip-lock back with a rolling pin to crush your nuts if whole, use about 1 cup of whole nuts to get 3/4 cups crushed. You want it somewhat coarse. 2. In a bowl mix the nuts with the beaten egg and the sugar. 3. Take 6 small ½ cup capacity Pyrex cups or a similar container and line the inside with aluminum foil. Spread ¼ cup of the mixture in the bowl, all the way up to the sides making sure you have a thin and even clean layer all around. 4. Bake at 350 degrees F/175 degrees C. until the nuts are golden and fragrant (about 15 minutes). Let cool completely before unmolding. 5. Melt chocolate (either in the microwave or over a double boiler). Dip the rims of the cooled nut bowls in the chocolate. Place in the freezer for at least 15 minutes or until the chocolate has hardened and is set. I love your selection of containers, especially the rice krispie bowl. Ooh, and I fancy one of those buns. Yum! These are wonderful creations. You really showed imaginative flair in constructing these fantastical objects. The brandy snap was delicious and crunchy while the banana & kiwi baskets were delightful cold treats. The maple syrup was made was how it should be – creamy and tasty. 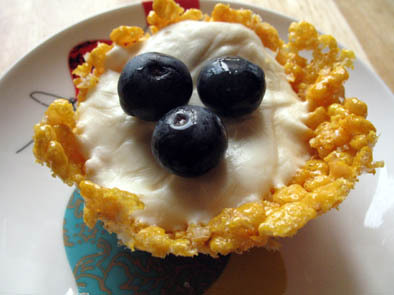 The use of Rice Krispies, redolent with memories of childhood parties, in this more elaborate guise is a lovely touch.